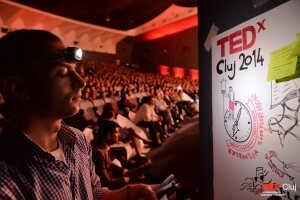 Having the fortune to be quartered in an elegant hotel planted on Calea Turzii, one long lane that cuts right through the middle of the southern half of Cluj-Napoca, meant TEDxCluj 2014 was at a walking distance. 17 minutes by Google Maps. And boy, was I eager to get to know this calm, yet growing oasis of economic boom in the western Romania! Luckily, as I walked downhill on a silent street towards the old center, the residential neighborhood unfolded rooftops of houses and the tower of the St. Mihail church aimed high in the November morning sunlight. It was Saturday, 7:30 a.m. Cold breeze in the cheeks. My destination was Florin Piersic Cinema, which opened its doors for more than 1.000 people that day, plus the speakers who made the most of their classic 20-minute chunks. Already tens of colorful people were swarming at the entrance, talking, gesturing in the air, savoring coffee, and grabbing badges as they walked in. Volunteers from Cluj HUB were facilitating the access through seven gates, so it took me 30 seconds to enter. This has been, by far, the best-organized local TEDx out of four editions that I’ve attended in Romania so far. But it wasn’t just the conference that made me get out of bed this early. It was also my role in the event. I wasn’t gonna climb on the scene. Yet, I had my own spot next to it, where I’ve done graphic recording all day. 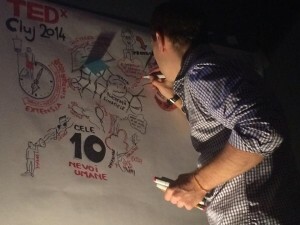 It’s been like last year’s one day-long graphic recording marathon at TEDxBucharest. Learn. Unlearn. Relearn was the main theme of this year’s edition. Unlearn and relearn is, as Alvin Toffler and Charles Darwin say, the ability of the 21st century. So the question was: how does our rather traditional approach to life, nation, community, profession and religion and their structure change as the years pass by? How is our historic period influencing the ecosystem? What would it mean to be able to virtually stretch our minds to a point where we could alter the learning process so that our development becomes an ongoing evolution? In a world where change is at a high pace, can we take on this evolutionary process and still keep our history, consolidate our values, sharpen our vision? This sure wasn’t one easy theme. And for almost 10 hours I’ve been listening, processing the various information, organizing it, then extracting the essence and drawing it onto these wide pieces of paper. As the hours passed by, on the scene came 21 guest speakers from different domains like IT, philosophy, art, journalism, psychology, poetry, business development, emergency services, debate, child healthcare system, NGO, and even royal descendants who tried to answer these challenging questions. Mr. Solomon Marcus, a member of Romanian Academy and renowned for his work in what he calls the mathematical poetry, computer science theory, semiotics and cultural anthropology. But most of all, he’s known for his personal endeavor towards unveiling the most important needs and fundamental rights of children, adolescents and youngsters and their benefits from a holistic education. Because – he claims – every field can be understood only through the connection with other fields. His speech was listing the 10 human needs: Identity, Transcendence, Refreshment, Sense of Life, Play, Bliss, Culture, Humanness, Watchfulness, Doubt. Staying within radical honesty means to be connected to our true selves and realise there is no need to hide. One quick way to do just that, says Blanton, is to connect with our own dumbness and realize that we are lying because we are might be taking ourselves too seriously. And last but not least, Princess Marina Sturdza has been a journalist for 35 years, she’s been vice president with fashion house Oscar de la Renta and is now President of Marina Sturdza Enterprises and Summits International, offering consultancy for charitable and cultural projects. Mrs. Sturdza had a powerful, heart-felt speech about the November elections and her trust in the major role played by youth in the change needed by Romania. Our strength lies in building leadership and vision upon the reminiscence of communism, she states, and that time is now. There are the three canvases that resulted (click to zoom). Was it a complete process of learning, unlearning and relearning? Maybe not. But it definitely was a transformational experience. It challenged not only my harvesting skills – which were up and running for a full day, but also my knowledge, my capacity for absorbing new information and my feelings, being connected to the speakers and their on-stage presence. Relearning: engaged! A special thank you goes to my love, Anca, who helped me complete the drawings by taking notes along the 10 hours of the conference and kept bringing them to me. Plus some beautiful strolls across the city.